Hello everyone! 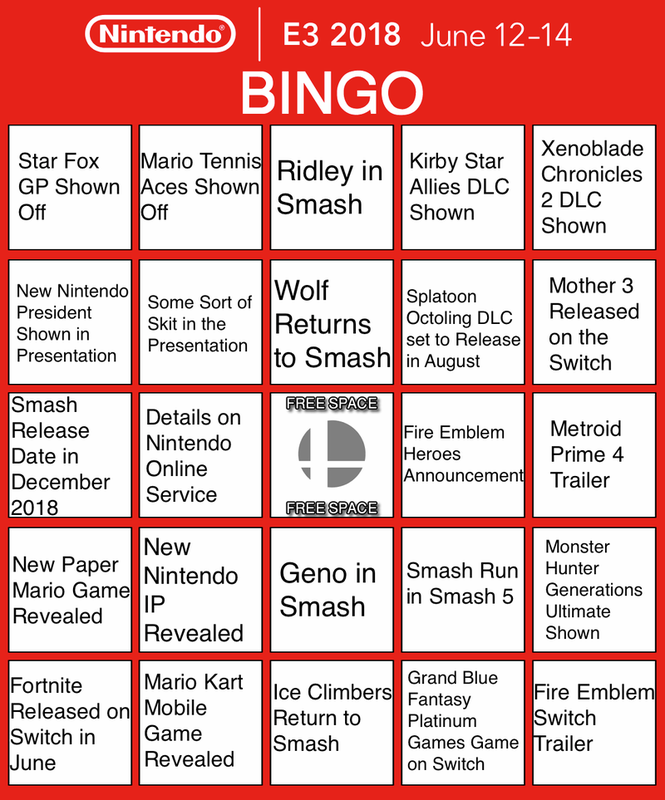 It’s been such a long time since the last time I made a bingo card for Nintendo’s E3 presentation and I’m happy to say that my bingo card for tomorrow’s presentation is all set. All I need to do is print the sucker out and then get some popcorn! Anyways, most of my predictions are centered around Smash 5 because from what’s been teased about this presentation is that it’ll be focused on Smash 5. The last time there was a Smash focused presentation, Smash was covered for roughly 10 minutes and a lot was revealed about the game. I heavily doubt that I’ll get all the Smash related spots on my bingo card, but man it’d be cool if I did. Also, I feel like there aren’t going to be too many new game announcements in the presentation. There aren’t a ton of 1st party Nintendo games that are announced to come out in Q3 and Q4 of this year and I think Nintendo is going to take the time give dates to the games that were teased in last year’s presentation. Man, I wish it were tomorrow already cus I want to know more about what purchases I’m going to be making at the end of this year! Also, here’s a link to the bingo card template I used if you want to make your own bingo card.